It was time for us to head down the other side of the Spencer Gulf into the Eyre Peninsula. It came to us as quite a surprise to find this peninsula was a whole lot busier than Yorke. Whyalla is the first major town you'll find along the east coast. It has all the conveniences of any major port town along with a nice hill to view the picturesque coast line. There is also a really cool gun placement which you can use to pew pew bad guys out of the sky! The reason for this is that a heap of steel was mined out of the area and used to make weaponry during the wars. A very industrious port town indeed! As you continue along the coast you'll find various small bayside towns, all supporting some mighty impressive jettys! We quite enjoyed walking out to the end of the jettys to enjoy the scenery looking back into town. All the fisherman will also gladly boast about their catch or inform you that they aren't biting today! One impressive jetty we enjoyed was the one at Tumby. There is a story here that apparently the government decided it had become too unsafe and was going to dismantle it from the end. The townsfolk all gathered and made a big blockade in front of the jetty. After that the town formed a committee to gain funds to keep the jetty in good order. Another thing that attracted us to Tumby was to try find the rare leafy sea dragons that live around the jetty. We were informed it's best to see them with proper diving gear but thought we'd try with our snorkeling stuff anyway. Turns out our dive day was a downpour day so we piked and continued south to Port Lincoln. One thing you'll find while venturing this area is the locals and the majority of visitors are quite keen fisherman. Now I'm no fisherman, but I had heard quite a few people boast about how easy it is to pull squid out of the Spencer Gulf! Well I ended up grabbing myself some cheap squid jig gear and managed to pull a couple of squid out over consecutive evenings! If you are travelling around the Spencer Gulf I would say it's definitely worth grabbing a squid jig. When it comes to fishing gear, you can spend as much, or as little as you want. A $12 Kmart combo rig with a $2 squid jig is the minimum you will need, grab a couple of different colours if you feel like really splashing out. When caught I gutted, chopped them up and then soaked them in milk until ready to cook. We covered them in flour with salt and pepper then pan fried them up, yummo! Port Lincoln is a great port town, home to the legendary horse Makybe Diva and allegedly boasts the most millionaires per capita in Australia. Tuna is one of the places big fishing industries and it brings in a phenomenal amount of cash to the region along side other the other aquaculture. Just south of Port Lincoln is Port Lincoln National Park. We heard Memory Cove was a fantastic place to check out, so ended up spending the night out there. The road to Memory Cove is 4WD but nothing too hard other than some rocky terrain, lots of potholes, a few washouts and some really narrow roads. Not recommended for caravans but fine for 4WD campers and camper trailers. As a good portion of the road is bumpy we took our time heading out enjoying the beautiful views along the way. Just like in the Yorke Peninsula we saw plenty of emus foraging around doing their thing. 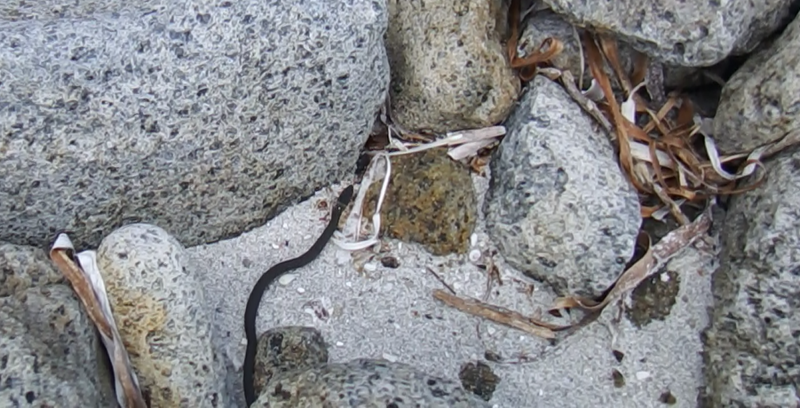 snake moving about the rocks. We then had a bit of lunch, then I jumped into the drink for a bit of a snorkel. The visibility here was ok and among the weed beds and rocks along the coast many pretty fish along with some good table fish could be seen. I did spot a really cool slender fish with bright blue tail but couldn't get close enough for a decent photo. As the sun rose to shine in a new day I heard a skippy by camp. Thought I'd get closer to see what it was up to and the bugger was chowing down on a fish skeleton! 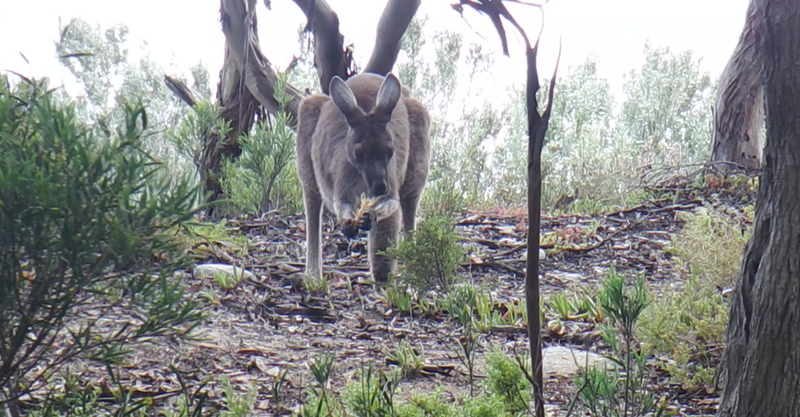 So there's something for all your vegan friends, kangaroos most certainly are not vegans! We decided to head back through the 4WD track and up to the more easily accessible parts of the park to check it all out. Plenty of great coastline, secret fishing spots and nice camping spots. I'd definitely love to spend more time in this beautiful national park down the track. If you are planning a longer trip into SA I would recommend grabbing a 2 month camping national park permit. South Australia really has some beautiful places to explore.